Solomon Burke dies at age 70. Solomon Burke the larger-than-life "King of Rock and Soul," whose songs blended soul, gospel, country and R&B, died early Sunday at Amsterdam's Schiphol Airport at age 70. He wrote "Everybody Needs Somebody to Love" in 1964 and it was later featured in the Dan Aykroyd and John Belushi movie "The Blues Brothers." The Rolling Stones and Wilson Pickett also recorded it. His song "Cry To Me" featured in the background as a bare-chested Patrick Swayze danced seductively with Jennifer Grey in one of the most memorable scenes from the movie "Dirty Dancing." 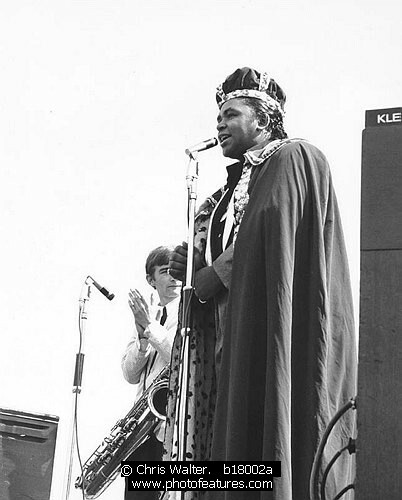 Photo is Solomon Burke in 1965 by Chris Walter.